A crumbling wall leads to a gruesome discovery for a home renovator when he discovers that a young woman and a toddler are trapped in a dark room in the basement of the house next door. The old man who lives in the house, despite his belligerence towards the police, claims to know nothing about the pair, though does admit to avoiding the basement in recent weeks because of strange noises coming from the vicinity. When DI Adam Fawley connects the house to the disappearance of a wife and mother two years previously, his team begin to focus on the two different investigations to see if they are connected in any other way. The young woman from the basement and the toddler who is almost certainly her son are unable or unwilling to speak, flying into screaming fits when they’re placed in the same room as each other. As Fawley digs, he discovers that the truth of the matter is stranger than anyone could have imagined. Cara Hunter’s debut novel, Close to Home, is barely seven months old, and still one of the standout books I’ve read this year. An excellent introduction to an engaging new detective, it’s a masterpiece of suspense and misdirection. 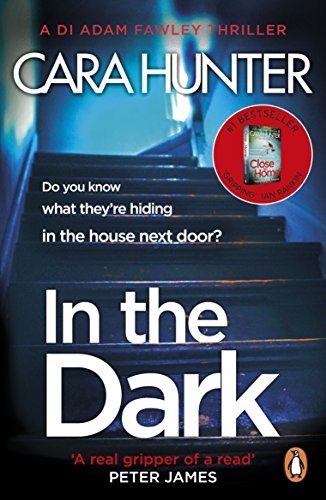 The good news is that DI Fawley’s second outing, In The Dark, is, if anything, even better than the first, and reveals whole new levels in Hunter’s ability to lead the reader in whichever direction she wants to take us, only to pull the carpet out from under our feet in the final act. Fawley and his team are back, the dynamics much the same as we’ve come to expect from their previous outing. The most obvious change is Gareth Quinn’s promotion to Detective Sergeant, introducing a tension between him and the other characters that was less obvious before. Not quite on the same level as Fawley, and now a higher rank than Everett, Gislingham and the rest, he finds himself in a constant state of needing to prove himself to one person or another. It’s a clever subplot, and shows a less likeable side to Quinn, and puts his actions very often at odds with the rest of the team and, more importantly, with what the reader expects from him. From the outset the case seems cut and dried: a young woman and her son are found locked in a small room in an old man’s basement. While the old man has a past that might implicate him in their imprisonment, little of what he does or says convinces us that he is guilty. Conflicting stories from the man himself, his social worker and his neighbours do little to clear him of any suspicion and, along with the police, we’re left to wonder if this is a man in the grip of dementia, or if it’s all a clever ploy now that he has been caught. The introduction of an older case, a missing woman who lived in the house that backed onto the old man’s, muddies the waters, and raises more questions about his involvement while introducing a swathe of new suspects, each of whom might have as much motive as the next. The cases are soon inextricably linked and we follow as Fawley devises then discards one plausible course of events after the next. Readers of Close to Home will know to expect a fair few red herrings as the narrative progresses: Hunter is unmatched when it comes to examining the ever-changing nature of a police investigation, the constant striving to make facts fit stories until all of the pieces fall into place. One thing you can be sure of while reading In The Dark: whatever you think you know, there’s a very good chance that you’re completely wrong. Hunter’s pacing is like lightning, but a more carefully-plotted, tightly-constructed mystery you’re unlikely to find in British crime fiction. Once again, In The Dark turns to social media to help drive the story forward. Online news reports, often filled with speculation and guesswork provide brief intermissions from the main action, while the comments section and social media feeds allow the reader to see the crime through the eyes of the public, an often frustrating process that will find us swearing vehemently at the armchair detectives (oh, the irony!). Cara Hunter has already proven her mettle with a pitch perfect debut. In The Dark is, surprisingly, even better than her first and doesn’t necessarily require knowledge of the first book to enjoy it (although I’m going to recommend that you stick to the prescribed order). It’s a lightning fast read that still manages to settle in the reader’s subconscious, where it’s sure to stick around for some time. Intelligent and gripping, In The Dark has a warm heart in the already-established characters and a wonderful sense of humour that doesn’t detract from the dark and intense subject matter. Book three is already making its way out into the world; I, for one, am celebrating this embarrassment of riches while it lasts. 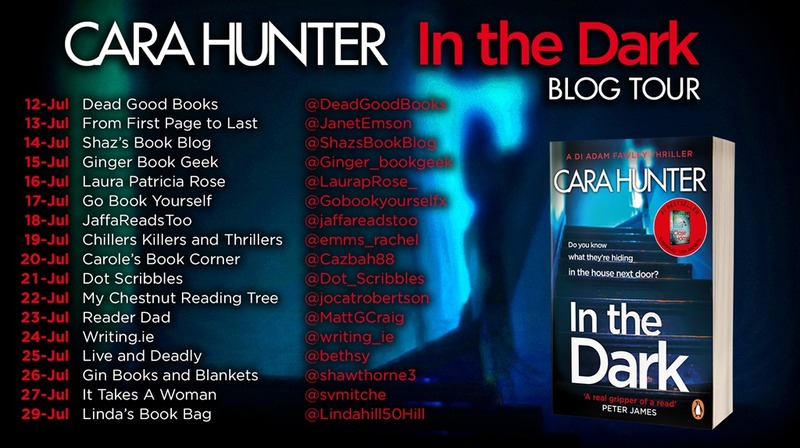 If you are in any way a fan of crime fiction or psychological thrillers, you can’t afford to pass up on Cara Hunter’s excellent novels. I found the epilogue confusing. Can you explain it? I presumed the body at the bottom of the cellar steps to be Tricia’s.